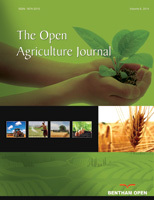 The Open Agriculture Journal is an Open Access online journal, which publishes research, review and letter articles in the field of agriculture, aims to provide the most complete and reliable source of information on current developments in the field. An online submission and tracking service via Internet facilitates a speedy and cost-effective submission of manuscripts. The full manuscript has to be submitted online via Bentham's Journals Management System (JMS) at https://bentham.manuscriptpoint.com/journals/toasj/ View Submission Instructions. This journal publishes open access reviews on recently published books (both print and electronic) relevant to the journal. Publishers and authors of books are invited to contact our book reviews editor at toasj@benthamopen.net with book review requests. All submitted books will be reviewed by an independent expert in the field. No page charges will be levied to authors for the publication of book reviews. Species names should be italicized (e.g., Homo sapiens). The generic name of a species should be given in full the first time it appears in the text. The author authority for each species is desirable on its first mention. Chemical formulae may not be used as abbreviations in the text. Genes, mutations, genotypes, and alleles should also be indicated in italics but the protein product of a gene should be in Roman type . Use the recommended name by consulting the appropriate genetic nomenclature database, e.g., HUGO for human genes. It is sometimes advisable to indicate the synonyms for the gene the first time it appears in the text. Gene prefixes such as those used for oncogenes or cellular localization should be shown in roman: v-fes, c-MYC, etc. In case of usage of symbols that do not conform to those that have previously appeared in the literature, their aliases may be obtained from the approved nomenclature in the Human Gene Nomenclature Database (Genew) [www.gene.ucl.ac.uk/nomenclature/guidelines.html] and LocusLink, to allow retrieval of all the information available for each gene. Krishnan P, Black TA, Grant NJ, Barr AG, Hogg EH, Jassal RS, Morgenstern K. Impact of changing soil moisture distribution on net ecosystem productivity of a boreal aspen forest during and following drought. Agric Forest Meteorol 2006; 139(3-4): 208-23. Rodrigues MA, Pereira A, Cabanas JE, Dias L, Pires J, Arrobas M. Crops use-efficiency of nitrogen from manures permitted in organic farming. Eur J Agron 2006; 25(4): 328-35. All authors must strictly follow the guidelines below for preparing illustrations for publication in The Open Agriculture Journal. If the figures are found to be sub-standard, then the manuscripts will be rejected.